Wine is all about stories. There’s the story inside the bottle, there’s the story outside the bottle and then there’s your story, the one that starts the moment you take the first sip of Warwick wine. It could be a Trilogy, an epic story of Three Ladies; the Black Lady, the Blue Lady and Lady Luck. Or perhaps your story involves Professor Black at the Penthouse on the Big Five Wine Drive Safari. 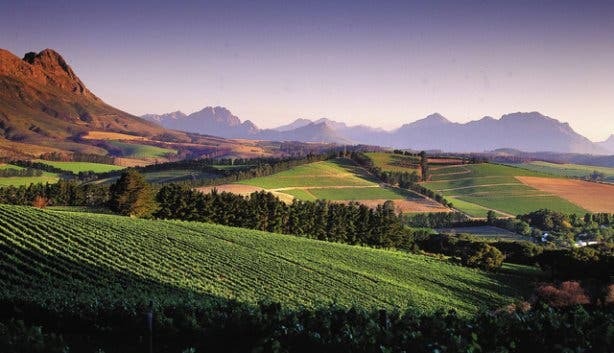 At Warwick wine estate in Stellenbosch, a story is always about to unfold. Once upon a time in 1912 Colonal William Alexander Gordon, of the Warwickshire regiment, decided to settle on a farm he called Warwick after the Anglo Boer war. Stan Ratcliffe bought Warwick in 1964 and together with his wife Norma planted the first Cabernet Sauvignon. The quality of the grapes inspired Norma to study wine making and off she went to Bordeaux. In 1984 Mrs Ratcliffe produced her first wine and soon made a lasting impression on the South African wine industry with the Warwick Trilogy, a wine based on the typical Bordeaux blend. Norma’s style of wine is not all about food pairing but, as with most French influenced wines, it goes well with food anyway. Which is good because I am here today to taste wines together with some delights from Warwick’s gourmet picnic basket, put together by chef Mark Springhorn. It’s my lucky day. Norma and her son Michael (who is the man in charge on the estate) are sitting down for lunch at an adjoining table. They’ve just bottled a new wine called Blue Lady and it’s time to celebrate. 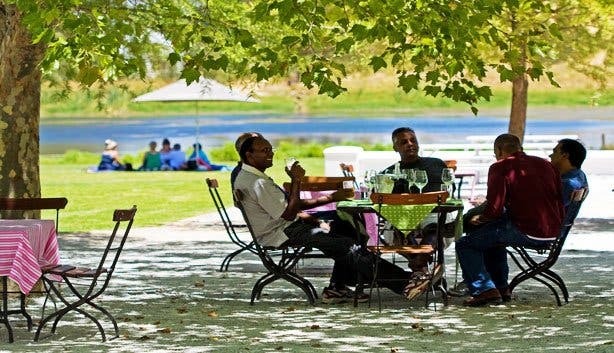 While the picnic facilities at Warwick also holds promise – besides the spacious lawn, they’ve built a couple of picnic pods that sit like birds' nests amongst the trees overlooking the lake and the mountains in the distance - it’s nice and cosy in front of the fireplace on a winter’s day. 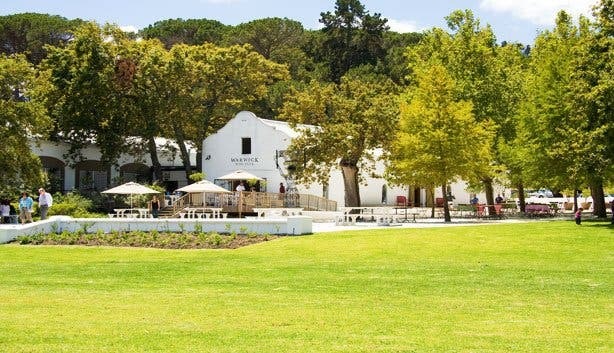 The Cape Dutch building that holds the Warwick Bistro dates from 1771 when the farm was still named De Goede Sukses (Good Success). It is also a national monument. 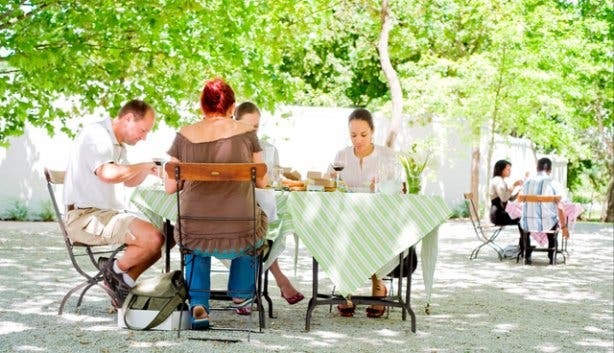 Warwick released their 2010 sauvignon blanc in June; the wine is called Professor Black, after the Professor Black peach orchard that was replaced with the sauvignon blanc vines. The Warwick Sauvignon Blanc is commonly known as a ‘two bottle wine’. You have one bottle and then you want another. There’s no time to test the theory though, as Norma Ratcliffe starts sending tasters from her private cellar to our table. “You should really try this 12-year old chardonnay,” she offers and soon a golden wine with the consistency of honey sparkles in my tasting glass. Next to the 1998, the 2009 Chardonnay looks pale and has a lot more lime and lemon flavours, compared to the nutty treacle of the aged wine. The chardonnay spends around nine months in French oak. 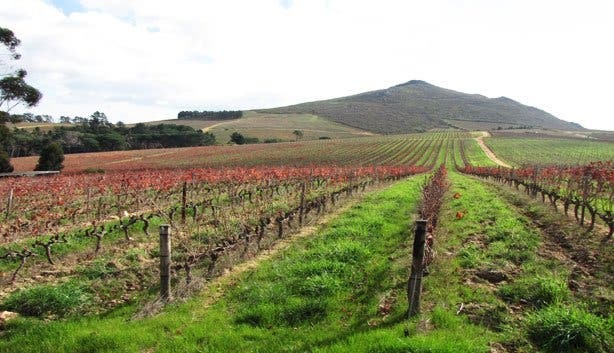 These days Norma calls herself the 'style director' of the estate and although she keeps a sharp eye on everything, the winemaking is strictly Jozua Joubert’s baby these days. 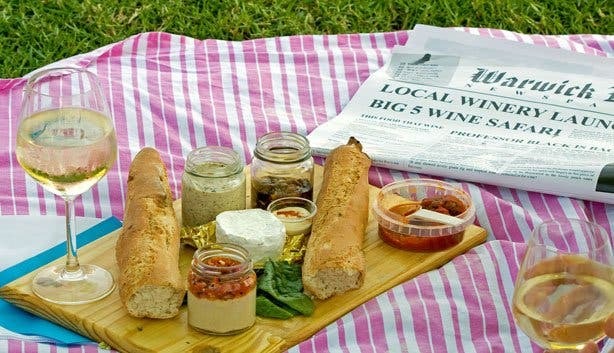 Picnic snacks fill the spaces in between sips of wine perfectly. The artisan ciabatta is still warm, and on it I smear smoked snoek pâté; also in the basket is biltong and brandy pâté, oak smoked cheddar, and creamy Camembert. There's a charcuterie selection, and oak-smoked Norwegian salmon, as well as delicate salads of green peas and Feta; and carrot and chickpea. A gourmet smorgasbord for sure, and to finish a decadent chocolate brownie topped with white chocolate ganache. A honeymoon couple in the corner gets up to have a drink from the wedding cup. Norma first discovered the wedding cup in an antique store. It dates from 14th century Germany and the legend goes that a love struck goldsmith first made the chalice in an attempt to win the hand of a beautiful woman named Kunigunde. Norma has 16 of these antique cups in her personal collection and also commissions and sells Warwick branded ones at the estate. The wedding cup has become the logo of Warwick and a symbol of love, faithfulness and good luck. Many wedding couples visit the estate to drink from the cup and celebrate their love. The story of my day on Warwick Estate ends well, with romantic views, generous people and unforgettable flavours imprinted in my mind. 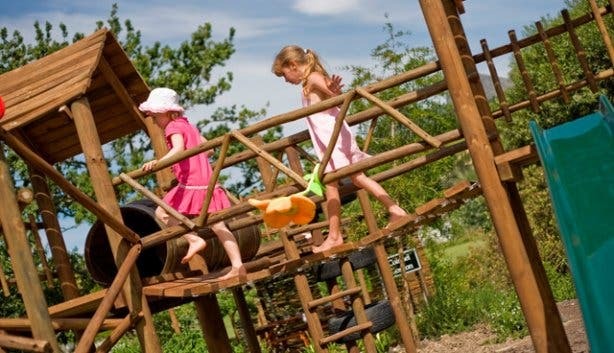 All happy memories from a unique wine estate in South Africa, to relive ever after. P.S. A tasting of seven wines costs R25, but if you buy a bottle it’s free. Wine prices range from R75 to R275. 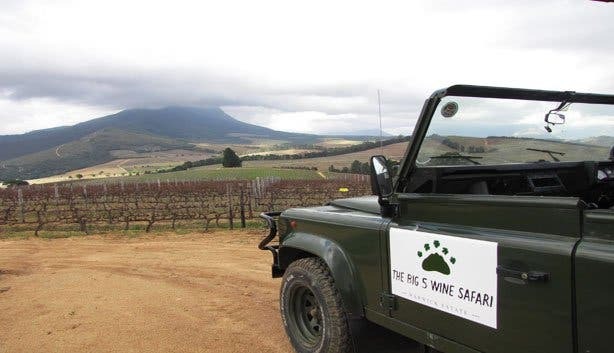 The Big Five Wine Drive Safari costs R50 per person and includes a glass of sauvignon blanc at the Penthouse. 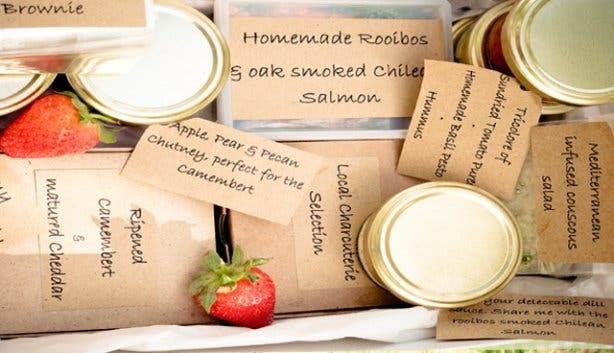 Picnics are R375 and serve two people, kiddies picnics are also available at R50.